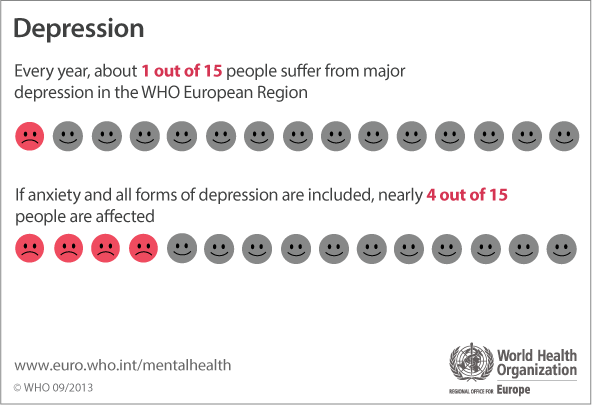 Each year, a quarter of Europeans suffer from depression or anxiety. It costs the EU economy about €170 billion per year, according to the World Health Organization (WHO). At the same time, over 50% of Europeans are overweight, and around 23% of women and 20% of men are obese. One in three 11-year-olds in Europe are overweight or obese. Both health issues are priorities for health organizations. Such is the challenge of depression to health that it is the focus of World Health Day 2017 on April 7. We know that depression can be effectively prevented and treated. Treatment usually involves either a talking therapy or antidepressant medication or a combination of both. Health organizations recommend a raft of measures to combat obesity, including introducing a colour-coded nutrition labelling system that points consumers to healthier options and monitoring food and beverage marketing. But there may be an even simpler solution – get people outside. According to a new report, people living close to trees and green spaces are less likely to be obese, inactive, or dependent on anti-depressants. Researchers at the Institute for European Environmental Policy reviewed 200 studies for Friends of the Earth Europe and reached the conclusion that being close to nature improves your health, even when controlling for other factors. For example, it found that middle-aged men living in deprived urban areas with high amounts of green space have a 16% lower risk of dying compared with similar groups living in equally deprived areas with less greenery. Unsurprisingly, the closer you are to nature, the more likely you are to exercise. In Denmark, people living more than 1km from a natural green environment were more likely to be obese and less likely to exercise rigorously than those living within 300m. Nature also has a positive impact on our brains. In Spain, people living within 300m of green areas said they had better mental health. Another study found doctors in urban areas with more trees on the street tended to prescribe fewer antidepressants than those in urban areas without trees. Access to the outdoors also improves old age. Older people are more likely to live longer if they live near walkable greenery filled public areas, found one study. Quite simply, people are happier and have lower mental distress when they live closer to nature. The report also looked at research on early childhood. It found that, for instance, babies born in areas with surrounding greenness have a higher birth weight and head circumference. And children living within 5km of diverse natural environments, such as forest areas and farms, were less likely to develop an allergy. What is the economic value of your city's trees? The research draws attention to inequality, in that poorer areas often lack green spaces. One study in the UK found that 26% of the black and minority ethnic population in England were more likely to be rare visitors to visit natural environments (compared with 17% of the rest of the population). The report cites plenty of examples where local communities have taken action, however. For example, a Swedish rehabilitation centre, shown in the image below, piloted a nature-based treatment for individuals recovering from stress-related mental disorders, stroke and war neuroses. Participants with severe stress and/or mild to moderate depression significantly reduced their need for health care. One year after rehabilitation, the costs for primary care dropped by 28% for the pilot, and days spent in hospital fell by two thirds (64%). Elsewhere, studies have shown that the Japanese practice of ‘forest bathing’ (spending time around trees) is scientifically proven to improve your health. Nature can also help to improve memory. Scientists at the University of Michigan tested the effect of walking through either a natural environment or down a busy street. The former showed better memory recall. Another study found that it was a possible treatment for Attention-Deficit/Hyperactivity Disorder (ADHD) in children. Outdoor activities in green spaces reduced symptoms significantly more than activities conducted in other settings, even when the activities were the same.